Today was a snow day for us, as sleet fell nearly all day yesterday and temps didn’t get out of the 20’s all day. This made for nearly an inch of ice on the ground and roads, making it dangerous for anyone to drive, much less kids and school buses. So no school today. I slept in a little, had a leisurely breakfast, and then puttered around a bit. I made a jambalaya for the crockpot (which turned out awesome–I will share the recipe later in the week), and did a little grading (not as much as I’d liked, but some is better than none). I did a little reading on the OH VSG boards, and saw that someone who was pre-op had asked a question about how folks have dealt with their clothing sizes changing constantly post-op. Several people had offered her suggestions about how to handle the rapidly changing sizes she’ll be dealing with, many of which were good. What do you do with your fat clothes? I know she was referring to plus-sized clothing. Certainly she meant “one’s larger clothes.” Certainly. She had to be. But I am pretty sure she didn’t mean it that way. I will likely be stuck in plus sizes the rest of my life. I can already feel my hip bones sticking out, and I can see my sternum and collarbones. I’m not anywhere near my goal weight, and I’m already bony. I’m still wearing plus sized clothing, but I’m at the smaller end of the spectrum now. So when someone says “fat clothes” and really means “plus sized clothes,” they really ought to reconsider their choice of words. For some of us, your “fat clothes” are our “regular clothes” and will be for the rest of our lives. Personally, I’m okay being plus sized the rest of my life. I never went into this process of losing weight with the goal of being a certain size, as I had no idea what I would even look like as a smaller version of myself–I’d never seen it! I went into this whole WLS thing with the goal of achieving health and mobility. Not getting down to a size 4 or whatever. What size my body settles at doesn’t matter to me. As long as I’m smaller than I was when I started, it’s all good, even if that means staying in plus sizes (just at the smaller end of the range). I am okay with being a size 14. It’s the size of the average American woman anyhow. So for once in my life, I’ll be happy being average. But don’t call plus sized clothing “fat clothes.” Doing so insults the women (and men) who must wear them because their bodies do not fit some preconceived notion of what a body should look like or be sized. In my opinion, there is no such thing as a “normal size” because what is considered to be “normal” is so subjective and distorted by images we see in the media. What I consider to be normal may not be what you consider to be normal. When I think of what a “normal” size is for me, I think more along the lines of what is a realistic size for my body? That seems more reasonable and achievable. Calling plus-sized clothing “fat clothes” also leads you to forget how your body is/once was, which is not something one should ever do: forget one’s origins. Be real with yourself: you are choosing/chose to have WLS because you are/were FAT. There is something to be said for remembering a time when you were larger and not forgetting what led you to have WLS in the first place. Today’s eating was pretty okay for a snow day. I didn’t get to make it to the gym, and was a sloth most of the day. Today, I got in 850 calories, 85 grams protein, 49 grams carbs and 36 grams of fat. 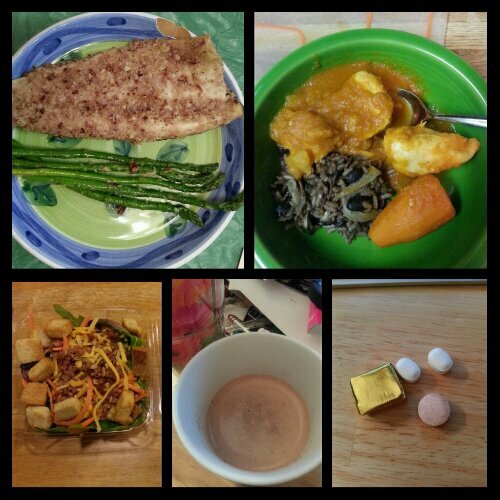 Today’s food choices, from upper right: Cuban style pollo guisado with leftover congri; multivitamin and calcium supplements x2, iron supplement; Swiss Miss diet hot chocolate; mixed green salad with carrots, cheese and bacon (no croutons); pecan-crusted trout with garlicky asparagus. I forgot to post up my food for yesterday, so here it is. I got in 963 calories, 89 grams protein, 67 grams carbs and 31 grams of fat. I drank 112 ounces of water. 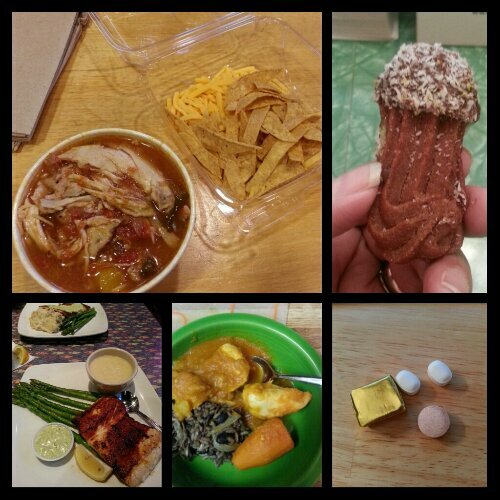 Sunday’s food choices, from upper right: chocolate shortbread cookie; multivitamin and calcium supplements x2, iron supplement; Cuban style pollo guisado with leftover congri; leftover blackened mahi and cheese grits; chicken tortilla soup with cheese and 2 crumbled tortilla chips. This entry was posted in daily bites, eating, la guerra, post-op, reflections, self-image, the little things, the sleeve, vsg, weight loss surgery and tagged daily bites, eating, frustrated fat, head trip, la guerra, omg I eat carbs!, plus-size fashion, post-op eating, post-op life, reflections, self-image, sleeve gastrectomy, the little things, VSG, vsg realness, WLS. Bookmark the permalink.